The reason for the stickiness in bond yields can be many, but the most responsible is the liquidity deficit stance taken by RBI, says Anup Roy. Rupee and bond markets adapted contradictory stances in the year 2015, while the local currency remained relatively stable but with a gradual depreciation bias, yields on the long term bonds remained stable too. This, despite aggressive rate cuts by the Reserve Bank of India, which is a bad news. Ideally, policy rate cuts should be followed by fall in the 10-year bond yields. But even as the central bank brought down its policy rate by 125 basis points, yields have fallen only 13 basis points. One basis point is a hundredth of a percentage point. The yields peaked at 7.995 per cent on May 7, but fell to 7.513 per cent on October 5. But those levels were not sustained and the bond yields ends the year at almost where it started and banks, who are continuously criticised for not bringing their lending rates, are not amused. The reason for the stickiness in bond yields can be many, but the most responsible is the liquidity deficit stance taken by the central bank. By forcing banks to borrow from the Reserve Bank of India at the repo rate, or through the marginal standing facility (which is 100 bps higher interest rate than repo), despite low credit growth numbers, the central bank unwittingly ensured that yields do not fall much, said bankers. Liquidity deficit peaked in November end, and banks had to borrow more than Rs 1 lakh crore from the RBI through repo and various liquidity windows. Advance tax outflows in December have aggravated the situation and bond yields started inching up despite falling after the Federal Reserve's rate hikes. "If banks have to permanently borrow from the RBI at repo rate, and then again from the MSF window, how can bond yields fall," said a banker who did not wish to be named because of the sensitivity of the issue. Despite good fiscal and current account deficit numbers, inflation remained volatile in the period. The bond market closely follows liquidity and inflation numbers. The consumer price inflation grew at 3.74 per cent in August, but started inching up and in November stands at 5.41 per cent. Though the RBI had warned that such numbers would emerge due to base effect, nevertheless, bond markets did not take it lightly. At the same time, revisions in GDP growth numbers were cause for concerns for the bond market. The constant supply in the bond market, at a time when appetite was running low due to impending Fed rate hike and limited play by the foreign investors, also dampened the sentiment in the bond market. Foreign investors had exhausted their $30 billion investment limit in the government bond market but more investment space opened up only when the RBI denominated the limit in rupee, rather than dollars. This opened up more space for the foreign investors and they pumped Rs 15,627 crore (Rs 157.26 crore) in the debt market in October. The investment limit will gradually open up to stand at 5 per cent of the outstanding bond, or an additional Rs. 1.2 lakh crore since October 2015 to March 2018, and this may act as a cap for yields, said Harihar Krishnamurthy, head of treasury at First Rand Bank. But these investors turned net sellers in the debt segment in November and December. The Indian rupee though emerged as one of the best performers in Asia in the period. Against the dollar, the rupee only depreciated 4.78 per cent, whereas Thai Baht fell 8.690 per cent, Korean Won fell 6.747 percent and Indonesian rupiyah fell 9.126 per cent against the dollar. Other emerging markets currency though, witnessed a rout against the dollar. Brazilian Real fell 32.6 per cent, Argentine Peso fell 35 per cent and Turkish Lira fell about 20 per cent against the dollar this year. Indian rupee's fall was partly stopped by the Reserve Bank of India's intervention and partly because oil importers needed less dollars to buy the commodity as prices crashed. "Crude oil saved rupee in 2015," said Samir Lodha, managing director at QuantArt Markets Solutions, a currency risk management firm. Rupee started the year at 63 a dollar level and will likely end the year well within the 66-67 range. Had crude prices not fallen, rupee would have fallen much below 70 a dollar, currency dealers said. Stability in rupee meant that Indian importers largely kept the positions open, only occasionally hedging under duress from banks as the lenders are required to incur higher provisions if its clients remain unhedged. Rupee's stability also ensured that hedging costs fell from 7-7.5 per cent to about 6 per cent now, indicating that rupee could remain stable next year too. 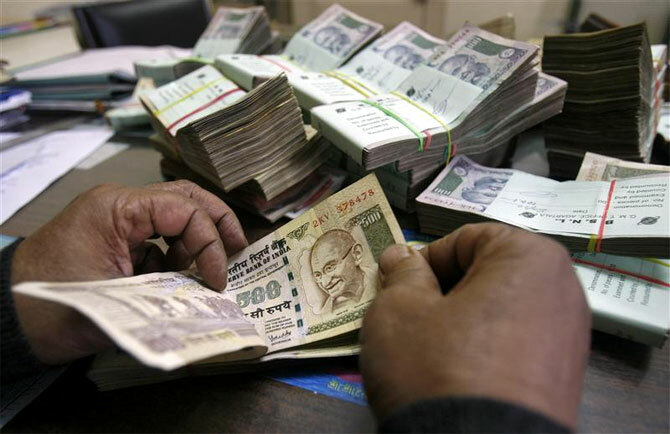 Banks' nightmare: Rs 5,650,000,000,000 may go up in smoke! Must read: At 68, THIS is how Narendra Modi stays fit!